On Friday August 5th our bus tour took us to the Railroad Museum of Greater Cincinnati in Latonia, Ky., Entertrainment Jct. in Monroe, Oh., and Cincinnati Union Terminal. During these travels we crossed the Hopple Street and Western Hills Viaducts. 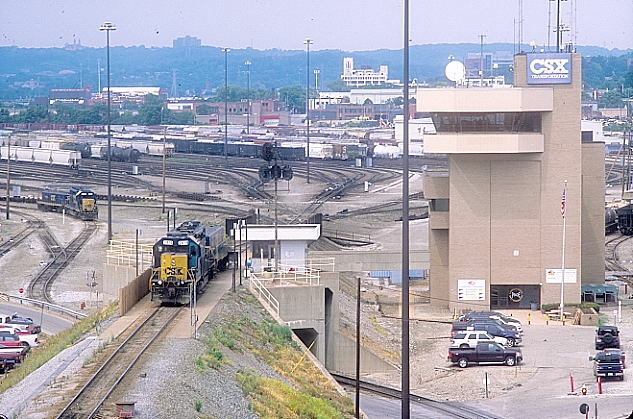 Arrangements were made with the police for our busses to stop on the viaducts for a few minutes, so we could get off for overhead views of CSX's Queensgate Yard. 1. 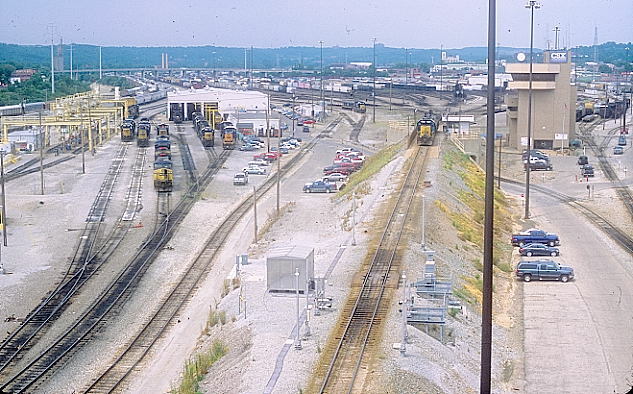 View from the Hopple St. Viaduct looking south at the Classification (Bowl) yard. Western Hills Viaduct is in the distance. 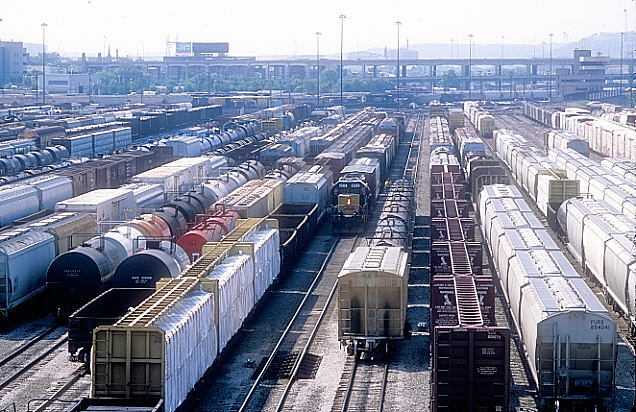 This is where trains are sorted and arranged into new trains. The car shop is on the extreme left. 2. 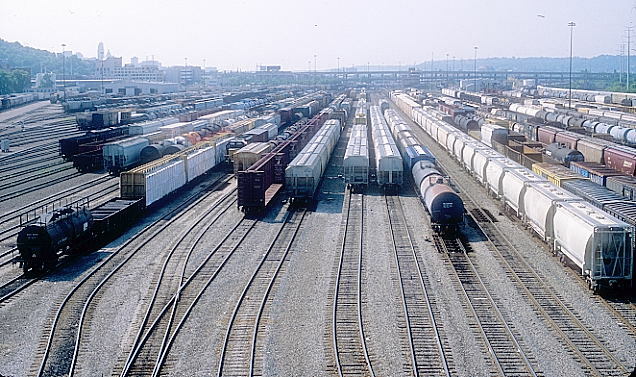 Another view of the Classification yard looking south with 8212. The hump is on the right in the distance. 3. 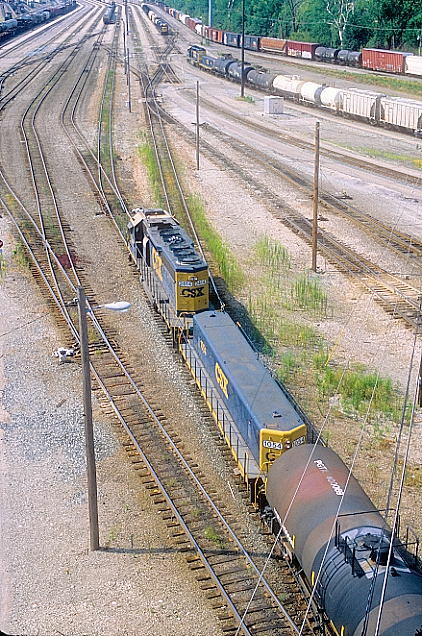 CSX remote-controlled SD40-2 8212 being operated by the employee on the front walkway. 4. We have moved to the eastbound land of the Western Hills Viaduct. 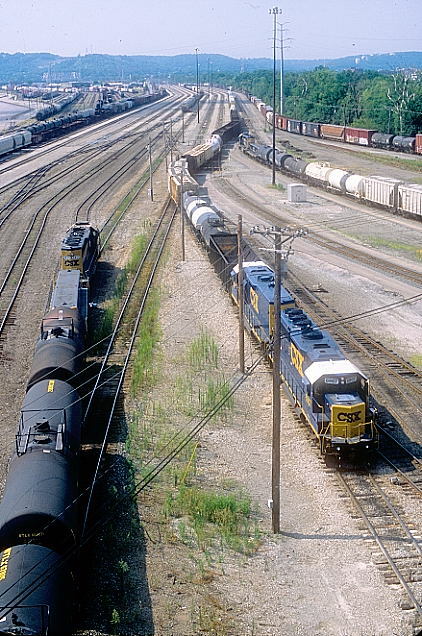 On the right is the CSX receiving yard. 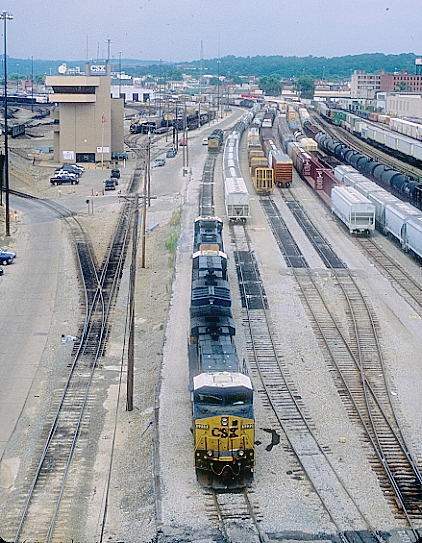 On the left is Norfolk Southern's Gest Street Yard. 6. 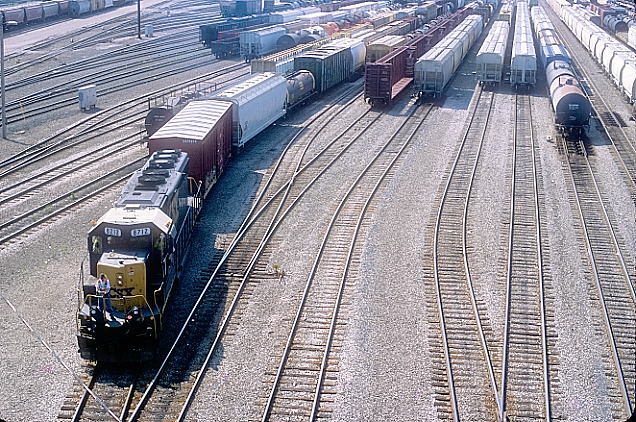 Mother GP40-2 6967 and slug 2367. 7. Hump engine shoving on left. Another hump set getting cars out if the receiving yard on the right. 8. 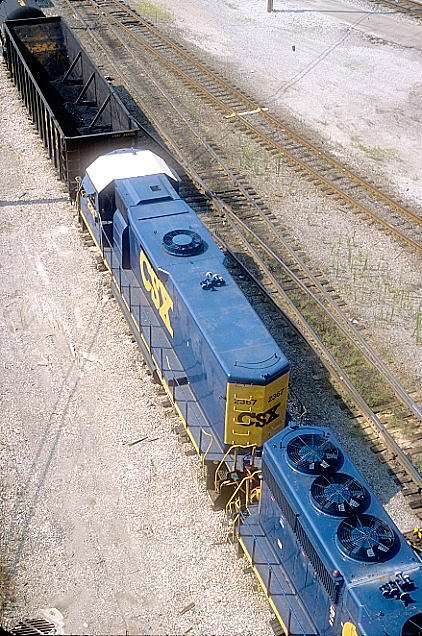 CSX yard slug 1054 and SD40-2 hump engine 2414. 9. 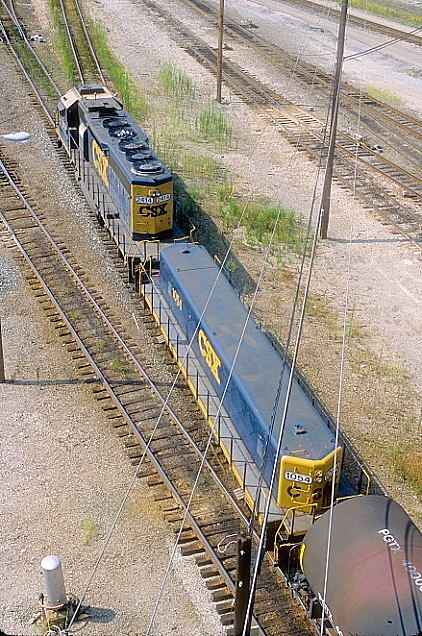 CSX yard slug 1054 and SD40-2 hump engine 2414. View 2. 10. Later in the day we stopped on the westbound land of the Western Hills Viaduct for these views looking north. No. 5239 is parked on the East Open Track which runs the length of the yard. The Departure yard is on the right. 11. Right to left is the engine servicing area, loco shop, hump and yard administration building. 12. Closer view of hump with SD40-2 2414-1054, seen earlier in the day, taking a break. 13. Engine terminal and loco shop. Receiving yard on left and classification (bowl) yard in background. 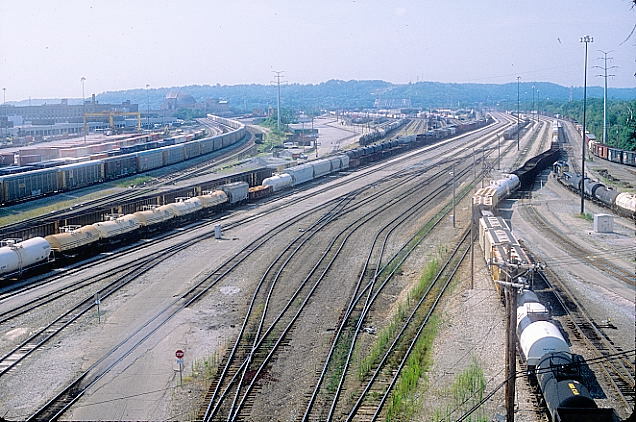 There are a couple of Genset switchers parked on the right. 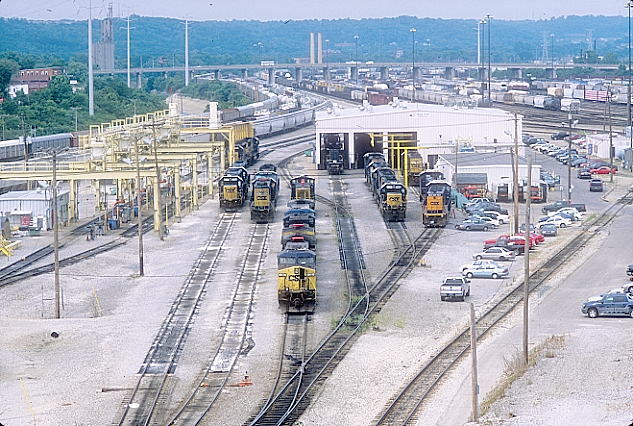 At two other conventions in the Cincinnati area we were given tours of the yard office, loco shop and car shop. 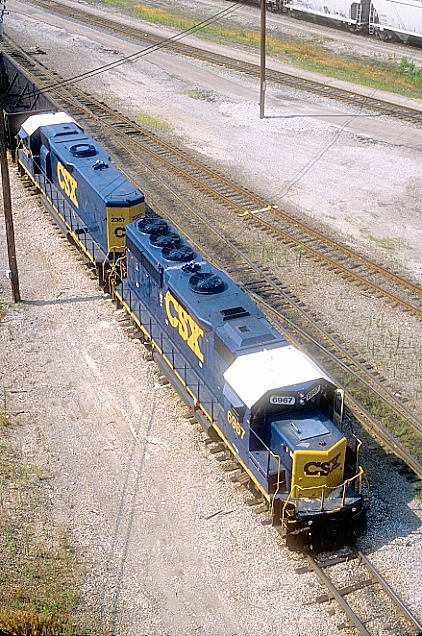 Regretfully CSX has changed their policy on such tours. At any rate, we greatly appreciate the efforts of the convention organizers who arranged for us to stop on the viaducts for these hard-to-get photos. THANKS!